Organization for the Prohibition of Chemical Weapons says deadly sarin and chlorine were used in two separate attacks in Syria. The Organization for the Prohibition of Chemical Weapons (OPCW) said on Wednesday that deadly sarin and chlorine were used in two separate attacks in the village of Latamneh in northwestern Syria in late March last year. "Sarin was very likely used as a chemical weapon in the south" of Latamneh on 24 March 2017, the organization said in a statement quoted by AFP. Its fact-finding mission "also concluded that chlorine was very likely used as a chemical weapon" at Latamneh's hospital and surrounding area on 25 March 2017. The March 24 sarin attack took place almost two weeks before the deadly strike on the then opposition-held and nearby village of Khan Sheikhun that left more than 80 people dead. The Khan Sheikhun attack on April 4, 2017, was previously believed to have been the first use of sarin by the Syrian regime since the deadly August 2013 attack in and around Damascus which killed hundreds of people. 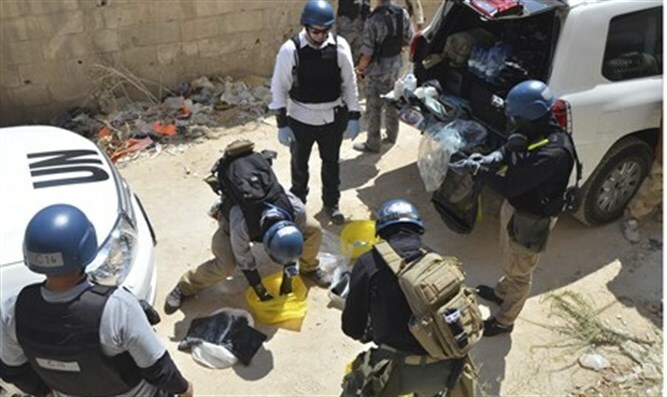 The latest conclusions by the OPCW on the March 24 and 25 attacks "are based on separate witness testimony, epidemiological analysis and environmental samples," the OPCW said, according to AFP. The large mass of information "required a longer period of time to draw conclusions," it said. The latest findings on the Latamneh attacks also come as the results of a probe of an attack on April 7 in the Syrian town of Douma are awaited. The OPCW’s inspectors entered Douma several weeks after the attack took place. The inspectors had been in Syria for a week but had not travelled to Douma because of security fears. Syrian President Bashar Al-Assad even claimed that the Khan Sheikhun attack was fabricated by the United States.